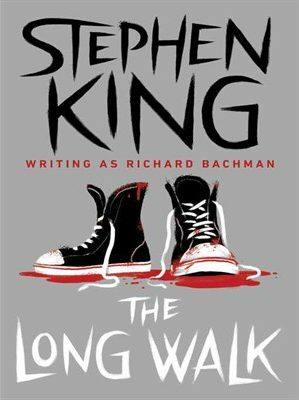 I’m going to be reviewing the Stephen King novel titled The Long Walk. I know I said I was going to review The Razorland Trilogy first (in the post Book Club) but I literally just finished reading The Long Walk so it’s still fresh in my mind. Plus, I felt a Stephen King novel (written as Richard Bachman) was deliciously apropos what with Halloween coming up and all. I did not purchase a physical copy of the book, which is 384 pages long and relatively short for a Stephen King novel, however I will be including several different illustrations of the cover art. I purchased The Long Walk on my Kindle Paperwhite and according to my Kindle (I forgot to mention earlier that it does that. Pretty cool, huh?) it takes about 5 hours and some change to read the whole thing. I started reading The Long Walk exactly 3 days ago (a little everyday obviously) but I passed out with 30 minutes still left in the e-book. I just finished the last 30 minutes today and decided to get to it while everything is still fresh on my mind. The cover art for the Kindle version I had purchased is shown above. Here’s a different version of the cover art. Getting the idea yet? The story takes place in a dystopian United States, taken over by the military and run by a man called “The Major”. Every year, 100 teenage boys (chosen at random from a list of thousands of volunteers) participate in a competition known as The Long Walk. On May 1st, the boys (and they are boys, some as young as 13) gather at the starting point (Maine) where soldiers check them in and give them canteens and food supplies. The Major greets them and assigns each one a number from 1 to 100 (in alphabetical order, by last name). The boys are supposed to stick the number on their chest (as shown on the cover art) because once the competition starts, the soldiers will be referring to them only as that number. The winner is granted his every heart’s desire – he could wish for anything and everything he wants – for the rest of his life. To win, you just have to be the last one left standing. The boys or “Walkers” as they are sometimes referred to, are supposed to walk as far as possible, following the route laid out for them (starting from Maine, see the map above) until only one of them is left. Someone actually mapped out their route on Google Maps (Click Here) or just log on to be able to see the route above. Once The Long Walk starts, it does not end, only until someone wins. The objective is to outlast everyone else. All they have to do is just walk. Each Walker must maintain a constant speed of at least four miles per hour (4 mph). 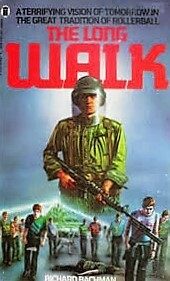 Soldiers riding half-tracks (military vehicle with wheels at the front and tank tread on the back as partially shown in the cover art above) measure the speed of the Walkers (to the fourth decimal point) and issue warnings to them when the Walker’s speed drops for longer than thirty seconds. If a Walker maintains his speed for an entire hour without dropping his speed once, the warning is then removed. Each Walker is allotted three warnings; if a Walker who has already had his three warnings, drops below the speed limit of four miles per hour (4 mph) yet again for whatever reason, the Walker gets “ticketed” by the soldiers, and is no longer part of the competition. Basically, if you slow down, you get a warning. After thirty seconds, you get another warning. If you’ve already accumulated three warnings, you just have to keep walking without slowing down, and after every hour, one of those warnings will be removed. Four warnings and you’re out. Here’s another version of the cover art for The Long Walk (I apologize for the quality but I’ll explain in a minute). When someone “buys a ticket” basically it means they get shot, courtesy of the soldiers on the half-tracks. There are several other ways to get “ticketed” immediately (without even having a warning issued out) such as; leaving the road for any reason, or attacking the soldiers. If the general public attempt to help the walkers or try to intervene in any way, they receive an “interference ticket” meaning they are shot as well. I cannot emphasize this enough. The Long Walk does not stop until only one person is left standing. That means they do not stop to sleep. They do not stop to eat. There are no bathroom breaks (the Walkers take care of their business at the side of the road, which always results in a warning or two being issued out to them). If they have to urinate, they unzip their pants, and considerately aim away from the other Walkers and urinate, all while still walking and maintaining their speed. Even if they are sick or injured, they are not allowed to drop below the speed limit of four miles per hour. Even if their legs cannot carry them anymore, they are supposed to do whatever they can to keep moving forward. If a person stops for whatever reason, they are issued three warnings before being given a fourth and final warning and getting shot or “ticketed”. Under no circumstances are the Walkers allowed to stop. Here’s yet another version of the cover art for The Long Walk. Even more chilling is the fact that The Long Walk is actually a popular national event with huge crowds showing up (think banners, fireworks, a marching band, etc…) cheering them on (some with bets already placed on who they think is going to win). The size of the crowd depends on the size of the town, as smaller towns obviously have less of a turn-out. Also, in some of the smaller places, the people just sort of stare at the Walkers as they pass by. Regardless of the size of the towns (big or small), the whole nation is watching! There are banners welcoming the Walkers once they reach certain destinations; even congratulating them for making it thus far. They walked through the rainy dark like gaunt ghosts, and Garraty didn’t like to look at them. They were the walking dead. 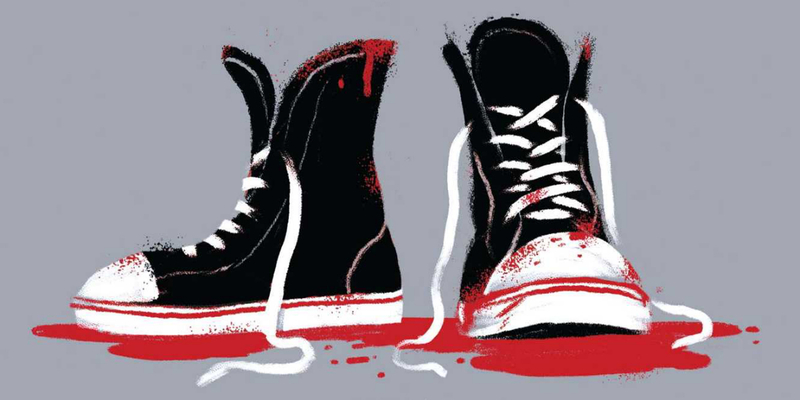 The main character is sixteen-year-old Raymond Garraty and the story unfolds through his eyes. Right off the bat, he develops a relationship with several of the other Walkers (with nothing else to do besides walk, naturally, the boys start conversing with each other). At first, a lot of them are chatty and talk about happier things like what they are going to do with the prize money once they win and things like that but once they get tired the conversations become much darker as they talk about their fears, death, and what comes after it. I won’t go too into it because I don’t wanna’ spoil it for anyone. You’ll just have to read the book to find out more. As soon as I started reading, I was mesmerized and couldn’t stop, until I’d legitimately passed out (I read in bed, at night). It reminded me of a movie that I’d seen awhile ago called “The Human Race” (I absolutely adore watching Horror/Psychological Horror B-movies) but now that I think about it, I’m pretty sure that movie was inspired by this book. I’ve also seen a movie called “Battle Royale” when I was younger which also placed kids in a life-or-death situation but in that movie, the kids were given weapons (albeit randomly) and were supposed to kill each other, until only one remains. The kids in The Long Walk aren’t supposed to kill each other as they aren’t even given any weapons. All they have to do is walk, until one remains, which sounds so simple, yet somehow I found that even more horrifying. A lot of people compare The Long Walk to The Hunger Games (which is suspiciously similar to “Battle Royale”) but unlike those two, where the kids weren’t given any choice on whether they would like to participate (as it was forced on them), in The Long Walk the boys actually volunteered themselves. They signed up for this. They filled out tests. They wrote an essay on why they believe they should be chosen to participate. It was a whole process. That is why I didn’t feel quite as bad for them, at first, because they had actually volunteered but as the story progressed and I got to know the characters (you really got the sense that you were being let in on the inner workings of a teenage boy’s mind) I started feeling so sorry for them. I mean, look at their route on Google Maps (shown above). Can you imagine walking all that way with no rest? Can you imagine not being able to sleep and yet still being forced to walk (while maintaining a certain speed)? Personally, I couldn’t even finish reading this book without passing out (from lack of sleep) and I was only reading (not walking), in the safety and comforts of my own home, in my own bed, and even though I was absolutely both fascinated and horrified by The Long Walk and wanted to stay up to finish reading it, I couldn’t even manage that much. 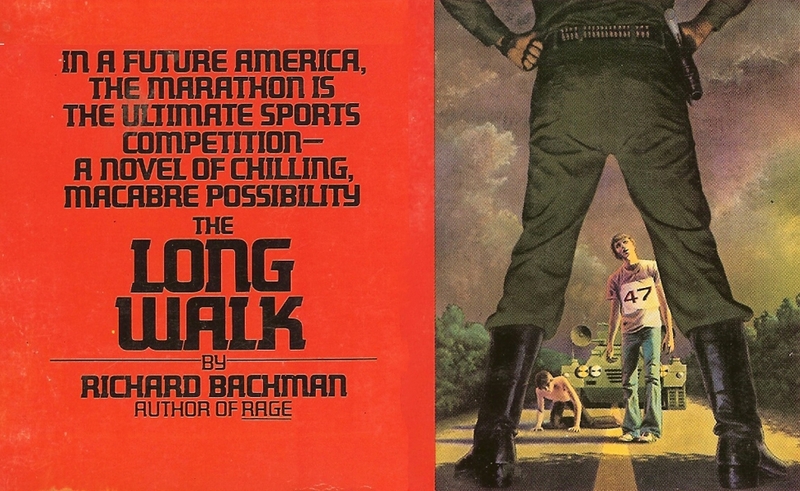 The Long Walk was originally published in 1979 (which should explain the quality of several of the cover art shown above) by a fresh-out-of-college Stephen King under the pseudonym Richard Bachman. The man is a genius! He took a bunch of kids, a road, a contest with sever consequences (such a simple concept) and created this masterpiece! I can’t believe he managed to craft this horrifying, chilling, spell-binding story when he himself was only a teenager! Like seriously dude what happened to you that you could come up with something incredibly dark and twisted like this… as a kid yourself? 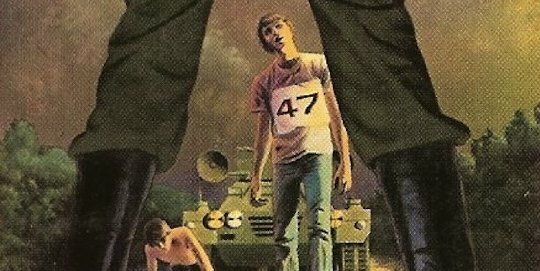 The Long Walk was my first Stephen King novel and I loved it! 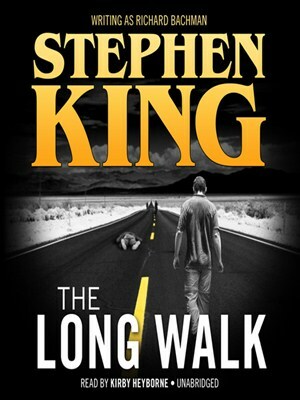 I’m a newly converted fan of Stephen King’s work and strongly suggest you all go out and get this in one form or another because The Long Walk is just too good to miss. Someone needs to turn The Long Walk into a movie, rapid. That’s nice of YOU to say! Thanks! It’s a really engrossing book! I wish someone would just turn it into a movie already (get on it, Spielberg)!